The Intel® NUC delivers stunning visuals and edge-of-your-seat performance in an ultra-small package. Powered by a Visibly Smart 3rd gen Intel® Core™ i3 processor on a 4-by-4-inch board and enclosed in a tiny case, the Intel NUC is big on performance, yet surprisingly small in size. It’s an ideal form factor for a small home office where space is at a ...premium. The included VESA mount allows for easy attachment to most modern monitors, allowing the workspace to have an uncluttered feel while not sacrificing performance. 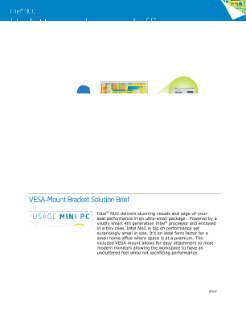 Read the full VESA-Mount Bracket Solution Brief. Gamers test out the Intel® NUC Kit NUC6i7KYK and are surprised with the phenomenal experience. Explore new technology, memory, storage, and OS options on the 7th Generation Intel® NUC.